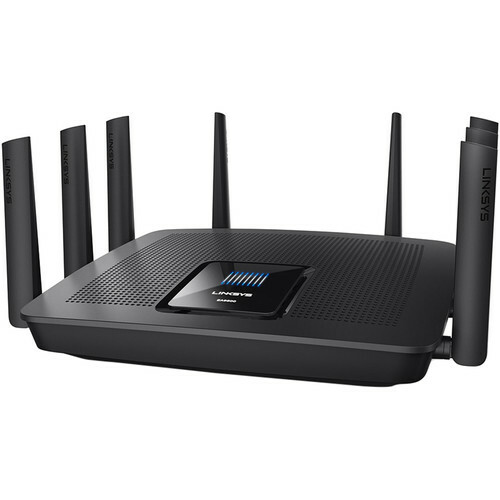 Upgrade your home's Wi-Fi network with the Max-Stream AC5400 Tri-Band MU-MIMO Gigabit Router from Linksys. Capable of up to 5.3 Gb/s of total Wi-Fi throughput, this tri-band router supports the Wi-Fi 5 (802.11ac) standard and boasts eight external antennas. Eight Gigabit Ethernet LAN ports allow for speedy wired connections to computers, game consoles, TV set-top boxes, and other Ethernet-enabled gadgets, while USB 3.0/3.1 Gen 1 and USB 2.0 ports let you share supported USB printers and storage devices over the network. The Max-Stream AC5400's support for multi-user MIMO technology allows for multiple devices to stream data simultaneously, while beamforming technology helps the router focus its signals toward nearby wireless devices. You can set up and configure the router using the Linksys app for iOS and Android. If you're working in your home office, you can quickly download large files, thanks to the Max-Stream's 1.4 GHz dual-core processor, which helps to deliver the performance necessary for seamless videoconferencing and fast file transfer. The AC5400 is capable of handling multiple high-speed data streams at once, delivering faster Wi-Fi speeds to more devices. WPA/WPA2 encryption and an SPI firewall help to keep your work files, data, and home network information safe. The Max-Stream AC5400 offers three independent Wi-Fi bands that deliver combined speeds of up to 5.3 Gb/s. Tri-band technology delivers up to double the wireless performance of a dual-band router. High-bandwidth applications like videoconferencing and movie streaming are ideal for the two 5 GHz bands, while lower-bandwidth devices like older wireless-N and -G computers can utilize the 2.4 GHz band. The router features eight adjustable external antennas that can be positioned for optimal performance. They provide powerful streams of data to your devices, helping to ensure Wi-Fi coverage throughout very large households. Unlike the two or three data streams found on other routers, the AC5400 delivers four simultaneous streams per band for stronger, faster performance. Play video games, listen to music, check email, shop, stream movies, and more, all without having to worry about signal drop-off. Beamforming technology directs Wi-Fi signals to each of your mobile devices. This focused direction helps to provide increased signal strength and coverage. Setup: Use your mobile device to manage your home Wi-Fi. Parental controls: Helps to ensure a safe internet experience for your kids, even when you're away from home. Restrict access to inappropriate or distracting content, control usage, and block specific devices from accessing the internet. Box Dimensions (LxWxH) 14.0 x 11.5 x 5.4"
Max-Stream AC5400 Tri-Band MU-MIMO Gigabit Router is rated 4.3 out of 5 by 333. Rated 4 out of 5 by mfmayes49 from Fast but under powered This router is fast but under powered, For a high end router it has low memory of only 256 MB whereas other routers have 512 MB, This affects the use of USB hard drives for media, I noticed it buffered a lot and paused as memory flushed out old data. The other routers that I have tested with 512 MB of memory don't buffer or pause on playback. Mapping the USB drives can be a pain, My EA9500 is not seen under network in windows file explorer. You have to manually map the drives, The other Linksys routers I have tested would automatic see the network drives under the router's name. If you going to use the drives for file access or backup, then you should be fine. The speed of this router is excellent and distance is very good. I have 20 devices linked to it wireless and cable, and doesn't slow down a bit.